Thank you for writing to me with regard to the NSA intelligence programs. It is extremely important that we strike the right balance between protecting the privacy of individuals while also protecting our national security. In doing so, Congress should ensure that individual privacy concerns are given full consideration and that we protect the Constitutional right of due process. I have always been a proponent of transparency within the government and I can assure you that this belief extends to the gathering of intelligence. As a matter of fact, I recently signed onto a bill that will reform the Foreign Intelligence Surveillance Act (FISA) court charged with overseeing requests for surveillance warrants. Specifically, this bill will create a Special Advocate who will be responsible for following FISA Court proceedings; an appellate review that will review FISA Court decisions on appeals; disclosure requirements by the Attorney General and reporting requirements from the Special Advocate. The American people deserve no less. I look forward to continuing this discussion in the future. Kirsten E. Gillibrand was first sworn in as United States Senator from New York in January 2009. 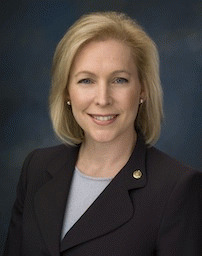 In November 2012, Gillibrand was elected to her first six-year Senate term with 72 percent of the vote, winning 60 of New York's 62 counties.